Many older people brush off the idea of investing in their teeth, deciding that they are “too old” to seek dental treatment at a dental clinic in Singapore. This could not be farther from the truth­ we at Orchard Scotts firmly believe that a person is never too old to deserve optimal dental health and a beautiful smile! All adults can benefit from dental treatment­ especially Invisalign. As we age, our gums and bones sometimes lose strength, and decrease in health. While it is rare, this is why people who are farther along in their years are sometimes unable to receive braces as a form of dental treatment. 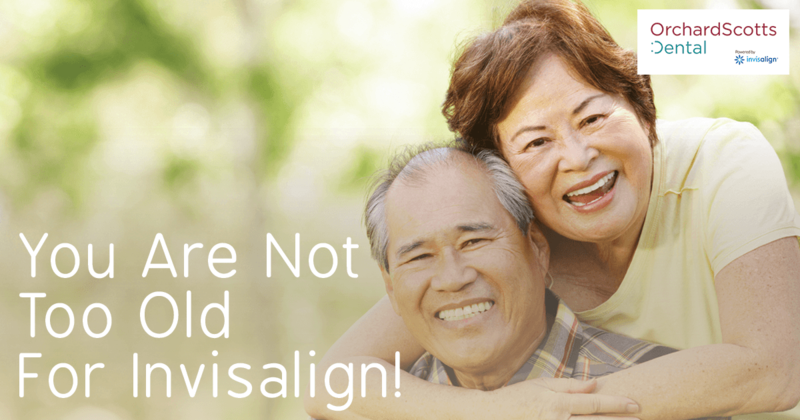 However, Invisalign could be the go-to option for an older person who is unable to use braces. All you have to do is visit your dentist in Singapore to discover if Invisalign is the right form of treatment for you! Many people associate orthodontic treatment with teenagers and think of puberty or teen years as the only window of opportunity during which they are able to undergo dental treatment. This could not be farther from the truth. Anyone is able to undergo dental treatment, no matter their age.­ All that is required is a desire to increase dental health and the appearance of your smile! While adults often shrug off the idea of dental treatment, the truth is that Invisalign was first used primarily on adults. Invisalign technology offers adults a great way to remain confident and efficient while also effectively working to better their dental situation. Invisible, comfortable, and requiring very little time and care, Invisalign aligners first became popular when they were used by various Hollywood movie stars. These adults loved that they could continue on with their normal lives without having to worry about how braces might impact their day to day work schedules, and their overall ability to thrive within the realm of their careers. If you are an adult thinking that braces is the only way to fix your teeth, think again­ – Invisalign is here to straighten your teeth, without infringing upon your work life, demanding too much time from you, or causing you to feel self-conscious. The main cited reason for adults turning away from the idea of obtaining teeth straightening treatment is that they associate fixing their teeth with the process of wearing braces. This idea deters adults from seeking treatment because they do not to affect their dental aesthetic. This is one of the main reasons why Invisalign aligners are such a fantastic option for adult dental treatment plans. However, it is important to remember that, while Invisalign is super convenient, relatively painless, and a great alternative for people who don’t want to/are unable to wear braces, it is not for everyone. Some elderly patients do not have the requisite bone and gum strength that Invisalign treatment requires, or the apt bone structure and tooth support. The best way to know if Invisalign is right for you is to ask your dentist. If your dentist deems your dental situation able to support Invisalign treatment, you will be on your way to having the best smile of your life!